Not that it shouldn’t provide indispensable leadership in ridding the country of Nicolas Maduro. Venezuela has imploded. The people are starving. The government under the dictatorship of the bus-driver-turned-tyrant, Nicolas Maduro, is inept and woefully corrupt. Anti-government protests abound. The region’s greatest powers, the United States, Brazil, and Colombia, have all aligned against Venezuela. Meanwhile, Venezuela is increasingly under the influence of Russia, Iran, China, and Cuba. From Spain to Brazil, the Spanish-speaking world has rallied against Maduro’s interminable reign. 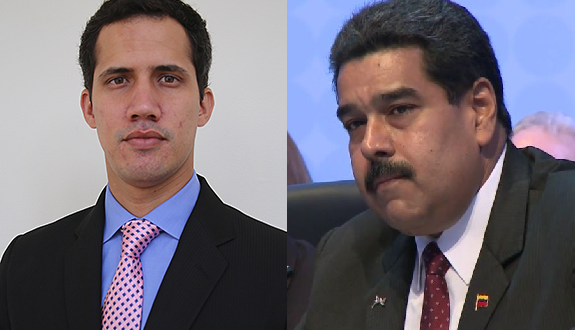 Things have gotten so bad for Maduro that the Trump Administration has opted to recognize his political opponent, the pro-democracy leader, Juan Guaidó as the official president of Venezuela. Essentially, the United States no longer recognizes Nicolas Maduro and his regime as the legitimate ruler of Venezuela and has begun acting as if Guaidó is the leader. Meanwhile, concern abounds that the Maduro regime will have Guaidó arrested. In response, Maduro cut all diplomatic ties with the United States, giving American diplomats 72 hours to vacate the country. Although, because of their recognition of Guaidó as the new Venezuelan president, the State Department refuses to allow for its personnel to be evacuated from the collapsing Venezuela. Already, the Venezuelan military has vowed to support Maduro. Given the unwelcome presence of American diplomats in Venezuela, the possibility of an embassy siege increases exponentially as time progresses. Nicolas Maduro’s allies in Moscow also appear to have been alerted to the trouble that his regime was facing. A mysterious Gulfstream jet flew in from Moscow and touched down in Caracas. Speculation that Maduro was readying to step down has been rampant. That is certainly a possibility (and would be the best possible outcome here). Although, should Maduro cave to Western demands, then the billions of dollars in loans that both Russia and China have lent to Maduro over the years would be void. So, too, would the special access to Venezuela’s wealthy oil fields that their alliance with Maduro afforded Beijing and Moscow. Under such circumstances, it would appear unlikely that Maduro would be prepared to evacuate from Venezuela. For its part, Moscow has already warned Washington not to intervene in Venezuela. There is also the issue of Cuban and Iranian involvement with the Maduro regime. Presently, Cuban military and intelligence forces are embedded with the Venezuelan military and are primed to move in and prevent any mid-level Venezuelan officers’ coup from occurring (especially as the tension between Maduro and his people increase). Yet, most of the Western world has come to recognize the government of the new interim president, Juan Guaidó. On the other end of the spectrum, the world’s autocrats appear to be standing firm behind Maduro — from Russia to Iran to Turkey. The biggest question underlying this controversy is whether or not the United States will risk getting involved militarily in the ongoing civil conflict in Venezuela. The longer the crisis continues and the more that the world’s great powers involve themselves in this affair, the louder the calls will be for the United States to intervene on some level. While many believe that American involvement is essential in this matter, given the fact that Venezuela is in America’s traditional sphere of influence, getting militarily involved right now in Latin America would be as disastrous as the American military intervention in either Iraq or Libya was. Still, the United States cannot simply do nothing. The better question for Americans to ask is: How does the Venezuela crisis end? Ideally, the crisis will end with a new, democratic regime. Should the United States take too much of an active role, though, as was the case during the Arab Spring, it is likely that the Venezuelans revolting against their government will turn on the Americans as much as they are turning on Maduro. A significant, direct American military involvement in Venezuela will not be conducive to anyone’s interests. It will not only waste money and potentially American lives, but it will also further destabilize the entire region, by creating massive refugee flows just as the American wars in the Middle East have done. America has potent regional allies in Colombia and Brazil. While Brazil is still recovering from an interminable decade of stagnation under its own socialist leadership, its recent election of a Right-wing president has already started to empower Brazil. Even though it has suffered economically, Brazil remains the most potent country in South America. As the former military attaché to the Colombian Embassy in Washington, D.C. told me in 2015, “The region looks to Brazil. Where Brazil goes, Colombia tends to follow.” It is essential that Brazil’s leader, Jair Bolsonaro, lead the fight against Venezuela’s Nicolas Maduro. From its perch in North America, the United States can do much to support a humanitarian aid mission into Venezuela (air dropping supplies, for instance) while lending covert assistance to Colombia, Brazil, and Venezuelan dissidents. Yet, the most powerful punch that the United States could pack would not be through overt military force, but rather through covert action and diplomacy. For instance, Cuba is key regional problem in this scenario. Cuba has been the conduit through which Iranian, Russian, and Chinese support for the Maduro regime has flowed. America must impose harsh sanctions against Havana until it ceases its illicit involvement with Maduro. I never understood why the Obama Administration attempted to normalize relations with Cuba. It only empowered Havana to misbehave more in Latin America. Also, the United States Southern Command must be given greater resources. At present, USSOUTHCOM is woefully underfunded and has few military assets that it could deploy to help buttress American allies in the region. Some U.S. Navy warships should be diverted from other theaters and sent to operate under the command of USSOUTHCOM. The essential element in this scenario would be American leadership as opposed to direct American military intervention. While this method may take longer and, therefore, prolong human suffering in Venezuela, this is the only viable option. After all, freedom isn’t free, and the United States has had ample evidence over the last several decades that it cannot fight for other peoples’ independence. The locals must do the heavy-lifting here and the United States being a global power must put pressure on the outside forces (namely Cuba) that are empowering the Maduro regime’s disgusting reign.